To Whom Available: Available to residential and farm customers, including churches and fraternal organizations, for general service who regularly use the Utility’s service throughout the year and who are located on the Utility’s distribution lines suitable and adequate for supplying the service requested. Character of Service: Alternating current, sixth hertz, single-phase, at a voltage of approximately 120 volts 2-wire, or 120/240 volts 3-wire. * Customer Charge for temporary service shall be $25.00 per month. Minimum Payment: The minimum payment for service shall be the Customer Charge. Deferred Payment: All bills on the above schedule shall be rendered and due monthly. If not paid by the fifteenth day following the date of billing, there shall be added five percent (5%) to the total amount of the bill. Remittances sent by mail on or previous to the fifteenth day as evidenced by the U. S. Post Office mark on the envelope in which they are received, will be accepted as a tender of payment within the time limit. When the fifteenth day falls on Saturday, Sunday, or any other legal holiday, the first business day thereafter shall be considered as being within the time limit. To Whom Available: Available to small commercial and industrial customers, including schools, whose monthly use has not exceeded a 750 kilowatt hours average for the preceding 12-month period, and who regularly uses the Utility’s service throughout the year, and who are located on the Utility’s distribution linnets suitable and adequate for supplying the service requested. Character of Service: Alternating current, sixty hertz, three-phase at voltages of approximately 480, 240, and 208 volts, or single-phase service at a voltage of approximately 120/240 volts. The Utility will supply service from its electrical supply lines at only such frequency, phase, regulation, and primary voltage as it has available in the location where service is required, and, if transformation of voltage is desired by the customer, will transform its primary voltage to one standard secondary voltage as herein above set forth. Any applicant requiring service differing from that to be supplied by the Utility as herein provided shall provide proper converting, transforming, regulating, or other equipment upon his own premises and at his own expense. Deferred Payment: All bills on the above schedule shall be rendered and due monthly. If not paid by the fifteenth day following the date of billing, there shall be added five percent (5%) to the total amount of the bill. Remittances sent by mail on or previous to the fifteenth day, as evidenced by the U. S. Post Office mark on the envelope in which they are received will be accepted as a tender of payment within the time limit. When the fifteenth day falls on Saturday, Sunday, or any other legal holiday, the first business day thereafter shall be considered as being within the limit. To Whom Available: Available to commercial and industrial customers, including schools, whose monthly use has exceeded a 750 kilowatt hours average for the preceding 12-month period, and who regularly uses the Utility’s service throughout the year, and who are located on the Utility’s distribution lines suitable and adequate for supplying the service requested. Deferred Payment: all bills on the above schedule shall be rendered and due monthly. If not paid by the fifteenth day following the date of billing, there shall be added five percent (5%) to the total amount of the bill. Remittances sent by mail on or previous to the fifteenth day, as evidenced by the U. S. Post Office mark on the envelope in which they are received, will be accepted as a tender of payment within the time limit. When the fifteenth day falls on Saturday, Sunday, or any other legal holiday, the first business day thereafter shall be considered as being within the limit. To Whom Available: Available to power customers for light and/or power service who are located on the Utility’s electrical supply line suitable and adequate for supplying the service requested. This rate is applicable to any and all industrial and commercial customers whose light and/or power service requirements are such as to require a connected transformer capacity in excess of 150 kVa. The Utility will supply service from its electrical supply line at only such frequency, phase, regulation, and voltage as it has available in the location where service is required; and will transform its primary voltage to one standard secondary voltage. Any applicant requiring service differing from that to be supplied as herein provided shall provide proper converting, transforming, regulating, or other equipment upon his own premises and at his own expense. Primary power service as described through the customer provided equipment will be subject to a 2% energy and demand charge discount. The sum of Customer Charge, Capacity Charge, and Energy Charge for the month. The Customer Charge plus 60% of the highest billing demand for the preceding 12 months times the demand charge. Contract for Service: As previously indicated, a condition preceding the Utility supplying service under this schedule, the Customer shall enter into a written contract with the Utility for a suitable initial contract period. Deferred Payment: All bills on the above schedule shall be rendered and due monthly. If not paid by the fifteenth day following the date of billing there shall be added five percent (5%) to the total amount of the bill. Remittances sent by mail on or previous to the fifteenth day, as evidenced by the U. S. Post Office mark on the envelope in which they are received, will be accepted as a tender of payment within the time limit. When the fifteenth day falls on Saturday, Sunday, or any other legal holiday, the first business day thereafter shall be considered as being within the limit. The maximum load shall be determined from the readings or indications of suitable demand measuring instruments; provided, however, that if welding machines or other apparatus where the use of electricity is intermittent or subject to violent fluctuations constitute a part of the entire load, the measurements shall be increased by the connected load in machines or other such apparatus, in the sum taken as the maximum load. The Utility further reserves the right to require the Customer to provide at its own expense, suitable apparatus to reasonably limit such intermittent fluctuations where, in the Utility’s judgment, such apparatus is necessary to prevent undue interference with the service of the Utility. The maximum load shall be taken as the highest average load in kilowatts occurring during any 30 consecutive minutes of the month; provided, however, that if such load shall be less than fifty percent (50%) of the maximum momentary demand in kilowatts, then the maximum load shall be taken at fifty percent (50%) of such maximum momentary demand; provided further, that the maximum load shall not be less than eighty percent (80%) of the product of the actual voltage multiplied by the maximum amperes and any phase multiplied by 1.73. Metering: The Utility reserves the right to meter at primary or secondary voltage. Power Factor: The Customer agrees to maintain unity power factor as nearly as practicable. The Utility reserves the right to measure such power factor at any time. Should such measurements indicate that the maximum lagging power factor for the billing period is less than 95%, the demand for billing purposes shall be the demand as indicated or recorded by the demand meter multiplied by 95% and divided by the measured average power factor in decimal. To Whom Available: Available to the Town of Walkerton and the various departments of the Town of Walkerton for municipal service. The Utility shall bill any department of the Town of Walkerton whose power requirements do not exceed 750 kilowatt hours average for the preceding twelve (12) month period on this schedule. 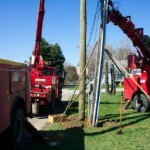 The Utility shall bill any department of the Town of Walkerton, whose power requirements exceed 750 kilowatt hours average for the preceding twelve (12) month period on this schedule. 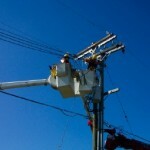 To Whom Available: Available for standard overhead Municipal Street and Security Lighting Services. Character of Service: alternating current, single-phase, sixty hertz, at a voltage of approximately 120 volts, 2-wire, or 120/240 volts 3-wire. To Whom Available: This is an experimental rate for Customers who have substantial requirements for electric metal melting and/or holding. The rate is available to industrial Customers with electric metal melting and/or holding facilities located adjacent to existing electric facilities adequate to meet the Customer’s requirements. A Customer requesting service hereunder is required to contract for a specific amount of electrical capacity, which shall be not less than 200 kilowatts. The Utility shall not be obligated to supply capacity in excess of that specified in the contract, or which exceeds the existing installed capacity. Customers with small power production facilities and/or peak shaving generation equipment are prohibited from taking service under this rate schedule; except when, by mutual agreement, such facilities may be used as set forth in the Contract (see Contract 1, Paragraph 3). Character of Service: The Utility will supply service to the extent of the capacity available from its electric supply lines at such frequency, phase, and regulation, and one standard secondary voltage of 480 volts or above, or the available primary or transmission voltage at the location where service is required. The Customer will supply, in accordance with plans and specifications furnished by the Utility, and at a mutually agreed-upon location on the Customer’s property, suitable buildings, structures, and foundations to house and support any protecting, switching, relaying, or metering equipment that may be supplied by the Utility. Hours of Service: Off-Peak hours of service are those not included in the On-Peak hours, and shall be expressed in Eastern Standard Time (EST), and twenty-four (24) hours on Saturday, Sunday, New Year’s Day, Memorial Day, Independence Day, Labor Day, Thanksgiving Day, and Christmas Day. The Utility may, by written notice, at its option, make available from time to time additional Off-Peak hours of service, which would immediately follow and/or precede those enumerated above if conditions on the Utility’s system so warrant. The additional Off-Peak hours of service may be reduced or withdrawn in their entirety upon notice by the Utility to be given not less than four (4) hours before the start of any Off-Peak period. Monthly Minimum Payment: The Customer’s Monthly Minimum Payment under this rate shall be the sum of the Demand Payment plus the Energy Payment, subject to the adjustments herein provided; however, in no case shall the Monthly Demand Payment be less than $2,112.50. Notification of Curtailment: The Utility shall provide twenty-four (24) hours advance notice before curtailing or interrupting service during Off-Peak periods. Deferred Payment: All bills under this schedule shall be rendered and due monthly. If not paid by the fifteenth day following the date of the billing, there shall be added five percent (5%) to the total amount of the bill. Remittances sent by mail on or previous to the fifteenth day, as evidenced by the U. S. Post Office mark on the envelope in which they are received, will be accepted as a tender of payment within the time limit. When the fifteenth day falls on Saturday, Sunday, or any other legal holiday, the first business day thereafter shall be considered as being within the time limit. Determination of Amount of Electric Service Supplied: The electric service to be supplied under this rate shall be measured as to Maximum Demand, Energy Consumption, and Power Factor by suitable meters to be installed by the Utility. Determination of Maximum Demand: The Customer’s Maximum Demand in any month shall be determined by suitable maximum demand instruments. The Customer’s demand of electric energy supplied shall be determined for each half-hour interval of the month. The phrase “half-hour interval” shall mean a thirty (30) minute period beginning or ending on a numbered clock hour as indicated by the clock controlling the metering equipment. The maximum metered On-Peak half-hour demand, adjusted for Power Factor. 40% of the maximum metered Off-Peak half-hour demand, adjusted for Power Factor. Determination of Peak Power Factor: The Power Factors shall be calculated, using the maximum On-Peak demand and the maximum Off-Peak demand, each expressed in kilowatts, and the lagging reactive kilovolt-amperes supplied during the same half-hour interval in which said demands occur. Power Factor Correction: For Power Factors of less than 95% lagging, the applicable demand shall be corrected by multiplying said demand by .95 and dividing by the Power Factor for the same half-hour interval in which said demand occurs. If a Power Factor is equal to or in excess of 95% lagging, then no Power Factor Correction is made. Contract – Contracts under this rate schedule shall be made for a term to be agreed upon between the Utility and the Customer considering the amount of the electrical load, the location of the electrical load, and the facilities to be furnished by the Utility to serve the electrical load. In such contract it shall be proper to include such provisions, if any, as may be agreed upon between the Utility and the Customer with respect to special terms and conditions under which service is to be furnished hereunder, including but not limited to, electrical capacity to be supplied, voltage to be supplied, and facilities to be provided by each party. This section allows the special agreements and special provisions requested by Customers. This would be an addendum to the Basic Rate. Metering – The electric energy to be used under the terms of this schedule shall be measured at the delivery voltage as to maximum demand, use of electric energy and power factor determination through meters to be located in a building or buildings provided by the Utility, and furnished by the Customer on the Customer’s premises. The Utility shall own, furnish, and install the necessary metering equipment. All bills, other than bills for the minimum payments, shall be calculated upon the registration of these meters. The meters installed on the Customer’s premises by the Utility under this schedule shall remain the property of the Utility and shall be safely kept and protected by the Customer. The Utility shall, at all times, have the right to inspect and test meters, and if found to be defective or inaccurate, to repair or replace them at its option; provided that notice shall be given to the Customer before testing the meters to that the Customer may have its representative present, if desired. Any meter tested and found to be not more than one percent (1%) inaccurate shall be considered accurate and correct, but shall be adjusted to be as nearly correct as possible. If, as a result of any test hereunder, any meter shall be found inaccurate or incorrect in excess of one percent (1%), such meter shall be adjusted to be as nearly correct as possible, and the reading of such meter previously taken shall be corrected to the percentage of inaccuracy so found, but no such correction shall, without the consent of both parties, extend back beyond one-half of the period between the date of such test and the date of the last prior test showing the meter to be within one percent (1%) accurate, nor more than forty-five (45) days after discovery of such defect or inaccuracy. During the time there is no meter in service or the meter in service is not registering, it shall be assumed that the energy consumed is the same as the daily average for the most recent period of similar operation with respect to usage of energy preceding the time the meter is out of service. The Customer shall also have the right to require a test of meters at reasonable intervals upon giving notice of its desire to have such test made by the Utility. The properly authorized agents of the Utility, displaying the official badge of the Town, shall at all hours have access to said premises for the purpose of examining, repairing, or removing its meters and other property and delivering notices hereunder, and no one who is not an agent of the Utility shall be permitted to handle, remove, or tamper with the same, except in an emergency. Additional Load – The Customer shall notify the Utility in writing of any substantial additions to or alternations in the equipment to be supplied with electric energy by the Utility, and such additions or alterations shall not be connected to the system supplied with electric energy by the Utility until such notice shall have been given by the Customer and received by the Utility. Discontinuance of Service – The Utility shall have the right to cut off and discontinue the supply of electric energy and remove its metering equipment and other property when any bill is in arrears, overdue, or in default, or upon violation by the Customer of any of the terms or conditions of the contract. Curtailments for Emergency Repairs or Line Extensions – The Utility reserves the right to interrupt service at any time when necessary to make emergency repairs. For the purpose of making other than emergency repairs or extensions to the lines, the Utility reserves the right to cut off the Customer’s supply of electric energy for eight (8) consecutive hours on any Sunday, or such other day or days as may be agreed to by the Customer and the Utility, provided forty-eight (48) hours’ notification previous to the hour of cut-off is given the Customer of such intention. Rules and Regulations – The Utility’s General Rules and Regulations Applicable to Electric Service are applicable to service hereunder. Force Majeure – The Utility will use reasonable diligence to provide a regular and uninterrupted supply of electric energy, but does not guarantee such supply. Neither the Utility nor the Customer shall be liable to the other for damages caused by the interruption, suspension, reduction, or curtailment of the delivery of electric energy hereunder due to, occasioned by, or in consequence of any of the following causes or contingencies, viz: acts of God, the elements, storms, hurricanes, tornadoes, cyclones, sleet, floods, lightning, earthquakes, landslides, washouts or other revulsions of nature, epidemics, accidental fires, collisions, explosions, strikes, lockouts, differences with workmen or other industrial disturbances, vandalism, sabotage, riots, inability to secure materials, supplies, or equipment, breakage or failure of machinery, generating equipment, electric lines or equipment, wars, insurrections, blockades, acts of the public enemy, arrests and restraints of rules and people, civil disturbances, federal, state, or other governmental laws, orders, decrees, restraints or regulations, and any other causes or contingencies not within the control of the party whose performance is interfered with, whether of the kind herein enumerated or otherwise. The Utility reserves the right to limit or interrupt service to the Customer when a shortage of capacity and energy exists. Settlement and lockouts shall be wholly within the discretion of the party having the difficulty. Such causes of contingencies affecting performance shall not relieve the Utility or Customer of liability in the event of its concurring negligence in the event of failure of either to use due diligence to remedy the situation and remove the cause in an adequate manner and with all reasonable dispatch, nor shall such causes or contingencies or any thereof relieve either from its obligation to pay amounts due hereunder or to pay Demand Charges or Minimum Bills accruing during such interruption or suspension of service. ALL TERRITORY FURNISHED ELECTRIC SERVICE.